Going to Mississippi in the summer of 1964 to join the civil rights movement, Patti Miller knew she was putting herself into harm's way. Then a junior at Drake University in Des Moines, she left Iowa knowing that civil rights workers had been beaten, jailed and three were missing and presumed dead. Ultimately, the west–central Iowa native was assigned to work in the community center in Meridian, Miss., the very town where the missing activists had been before they disappeared. Their bodies were discovered, buried in an earthen dam, the day Miller started her month–long stint as a missionary of civil rights. "My very first day of work was with the knowledge that three of our fellow workers were dead," Miller, now a resident of Fairfield, told an audience at Southeastern Community College during a Black History Month address Monday. The Mississippi Summer Project came in 1964, a period known as Freedom Summer, when northern whites descended upon the south to register blacks to vote, inspire southern youth to get involved in the civil rights movement and to provide educational resources for black youth who were denied such things as libraries. "I had to go," Miller said in a clip from the documentary film she is working on about her experiences. Miller grew up, to use her words, in a "Lily–white" rural Iowa town, and before going off to college, the only time she ever saw a black person was on family trips to Des Moines. She, like many northerners, knew nothing of the system of legal segregation that formed in the south in the years after the Civil War. Miller said she wholeheartedly accepted what she had been taught in school — that Lincoln had freed the slaves and people of all colors and creeds lived as equals. "I really believed that's the way the world was," Miller said. The stage for her enlightenment was being set by southern blacks in places like Montgomery, Ala., and Greensboro, N.C., with bus boycotts and sit–ins meant to protest the Jim Crow laws that prohibited blacks from sitting at the counter in diners, riding in the front of a bus and countless other restrictions on integration. 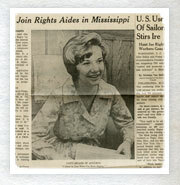 Miller's own experience in the civil rights movement grew out of her experience with a Methodist student group at Drake, where the white southern adviser suggested taking a page from the Freedom Riders of 1961, who attempted to spurn a Jim Crow law that prohibited interracial transportation aboard interstate buses. Northern college students, starting from Washington, D.C., attempted to drive a bus through the south en route to New Orleans. Their travails, including the firebombing of their bus, resulted in a federal law change requiring interstate buses to be integrated. In the spring of 1962, Miller and nine others got up the money to buy a hearse, installed some seats in the back and headed south. "I have to tell you, this trip was an absolutely eye–opening, take away my naiveté, 180–degree turn for me," Miller said, adding that after seeing those Jim Crow laws in practice, with segregated drinking fountains, waiting rooms and theaters, "I was a changed woman." The disappearance in the summer of '64 of the three civil rights workers, including a young black named James Chaney from Meridian, created an atmosphere for the entire country's attention coming into focus on the south and the systematic discrimination against blacks. President Lyndon Johnson made the search for the missing workers a matter of national importance by sending the FBI to Mississippi in hopes of locating them. The search was never a hopeful one. "When you're missing and a civil rights worker in the south," Miller said, recalling those times, "you're dead." The added attention given by northern whites whose children were going south to help support the civil rights movement also helped bring the struggle for equality home in a way that only the bravery of people like Rosa Parks and the Rev. Martin Luther King Jr., had until then, she said. On the bus from Jackson, Miss., where she had her training for the summer, to Meridian, looking out the windows at the swamps the FBI was searching so fervently for her three compatriots in the movement, Miller said she realized she could die. The thought didn't cause her to descend into fear. Instead, it gave her resolve. "I had seen so much of what has been happening to my black brothers and sisters, that I thought, this is a purpose worth dying for," said Miller, who later worked with King in Chicago. Every day of the month she spent in Meridian brought with it the risk of death, but perhaps none were more traumatic than the first four days. Miller's third day at the community center was spent walking through the community, inviting black residents to participate in burial marches for the funeral of the slain black civil rights worker from the town. The march was on Day 4. "That was one of the scariest times of my life," Miller said of the march, which passed through several white neighborhoods. Looking back on that summer, Miller said the effect was tremendous, resulting in passage of the Voting Rights Act of 1965 — federal legislation that came a year after passage of the Civil Rights Act. The next year, after graduating from Drake, Miller went to Chicago to recruit college students for the civil rights movement in their own backyard. Discrimination was more subtle but still existed in the north. Violence in the northern civil rights marches was greater than anything that she experienced in Mississippi. But violence sometimes went both ways. The day King was assassinated, the students and the black teachers at the all–black Chicago high school where she was teaching were allowed to go home. White teachers, meanwhile, had to stay out of concern for their safety. There was rioting in the streets and whites caught in the wrong place might be killed. The irony was not lost on Miller. "It was the strangest experience for me," she said. "I'm in the community where I had worked with Dr. King, and now I'm the enemy and I'm holed up in a school building." Miller urged her listeners at SCC to heed the lessons of the 1960s, and as she has done, work personally and with others to appreciate peoples' "common humanity." "There's so much left to be done," she said. The Black History Month event was co–sponsored by the Burlington chapter of the African American Historical Museum and Cultural Center of Iowa. Located in Cedar Rapids, the center is dedicated to preserving and telling the stories of African–Americans who have lived in Iowa. Miller's film includes period photos and newspaper clippings, as well as interviews from a visit back to Meridian in 2004. Partnering with Iowa Public Television on its production, she has recently applied for a grant to help finish the project and hopes to have it ready to air next year.